Welcome researchers and scholars from both academia and industry to submit your papers to ICLL 2019. We're recruiting new members to join the committee to help ensure the quality of peer review of the papers of ICLL 2019. The conference is soliciting state-of-the-art research papers in different scientific fileds related to linguistics and literature. The conference is filled with rich academic activities, which include invited speeches, technical sessions, academic visit, local city tour. 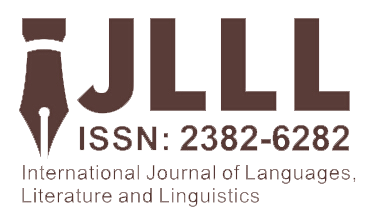 Submissions will be reviewed by the conference committees and journal editorial board, and accepted papers will be published in International Journal of Languages, Literature and Linguistics , which will be indexed by Google Scholar, Crossref, Proquest, etc. Note: For those who're NOT looking to publish their papers, it's acceptable to submit your abstracts to the conference just for oral presentation without publication of full paper, which will be sent to at least two techinical committees for a brief review, and it will take about 10 working days. Welcome senior scholars and researchers to join the ICLL conference program committee to help review papers submitted to ICLL . Applicants should send your CV to icll@iacsitp.com . Prof. Dr. Sergey Avrutin will give a keynote speech at ICLL 2019. The title of his speech is 'What Journalists, Children and Individuals with Brain Damage Have in Common: An Information-Theoretic View on Lexical Omissions'. (Click).